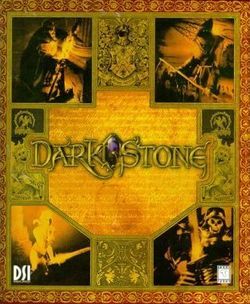 Darkstone (called Darkstone: Evil Reigns in the United Kingdom) is a Role-Playing Game by French developer Delphine Software International released in 1999. Darkstone has many similarities to Diablo, particularly in the user interface. The game can be played single player or multiplayer. Multiplayer games may be cooperative or competitive. Multiplayer games can be played over a LAN (using TCP/IP or IPX) or the Internet. The game includes its own server, so it is not necessary to locate a dedicated game server; any player can initiate a multiplayer session which other players can then join. The user interface is similar to that of Diablo (the developers of Darkstone acknowledge the earlier game as an important influence). Characters can be moved around by simply clicking on a location. Clicking on an enemy initiates an attack. Clicking on an item picks it up. Each character has an inventory that can be opened. Items can be rearranged or removed. A unique feature of the game is that in the single player game the player can control two characters. At any given instant, one character is directly controlled by the player. The other character will act intelligently for the most part: it will follow the other character unless ordered not to and will defend itself against enemies. The player can switch between characters with a single click. This page was last edited on 9 May 2018, at 13:12. This page has been accessed 20,737 times.